I was presenting in my past articles the approach which allows to generate test cases for combinatorial problems. This is very large group of aspects we encouter when dealing with problem of assuring the quality. Still, there is an area where we need more general approach. Let’s think about simple GUI application which allows you to log in and fill in some form which can be saved. We have combinatorial aspect when filling in and saving it as we can do it in many ways. But what about the situation we just cancel form filling? Or else we will fill in many form in the row? As you most probably know state transition diagram comes in hand. This is test design technique focusing on most general aspect of the application which is application state and transition context. I would like to show in this article how to practically model application using this technique and most importantly how to automatically generate test cases with specific coverage which will be instantly executable. Speaking about the coverage: according to my idea the coverage for diagrams is basing on how many times each transition is used: I call it N-tn coverage. So when I say 2-tn coverage it means each transition which is present in the diagram will be used at least twice. It is worth to notice this is something different in comparison to what you can find in QA literature where you can find N-switch coverage. As you probably now, 0-switch coverage means you test single transition (no states), 1-switch coverage means you test 2 transitions (the piece of diagram with 2 transitions and 1 state) and so on. This is nice but I think hard to use in pratice. Why? Because to test specific part of diagram you have to render the application into specific state: you have to execute all the states and transitions which lead you to the state you choose as starting point (setting the state of application without executing the path – like updating database, caches and other stuff manually – is very risky in my opinion and should be avoided). It is just better to avoid complex setup process. Repeating transition once, twice and thousand times are all different test cases. Here you can clearly see how many test cases you miss to reach 100% confidence your application is working as expected. Anyway, theory is very nice but let’s apply it in practice to make it useful finally. In general, we need just the same as what was the case for combinatorial problems: we need a model, generated test cases in xml format and generated test cases in domain language. 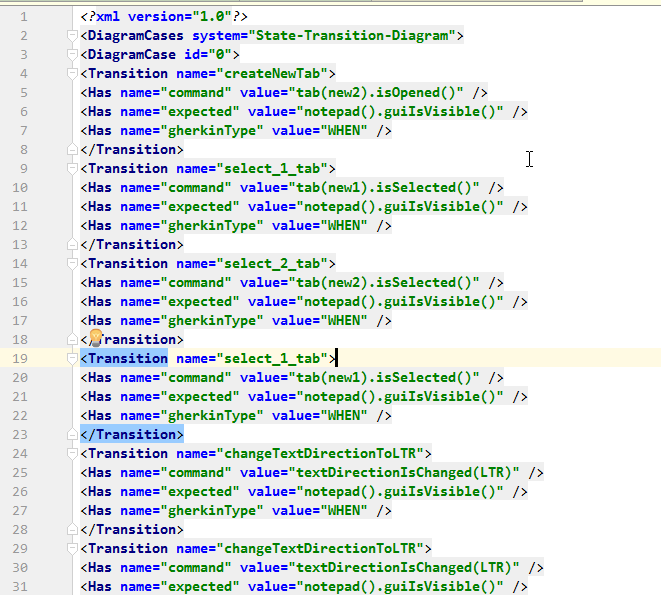 Please note, expected results for each transition is “notepad GUI is visible” which is quite trivial. This should be more meaningful when doing real diagram model. At this point we need some software to find valid paths through the diagram with given N-tn coverage. I couldn’t find anything useful in the internet so I wrote myself the piece of software. You can view the code under automatic-tc-generation-from-diagram-another-approach branch HERE. This is: src/test/java/com/passfailerror/diagram2sequence_generator/Diagram2SequenceGenerator.java class. – notice, it makes sense to generate more than one diagram case as each time specific N-tn coverage is generated different path is chosen. src/test/java/com/passfailerror/testcases_generator/Generator.java class which receives extra parameter TestcaseSourceType which in turn allows to generate test cases both for TCases output file and diagram cases output file. The sequence of WHENs and THENs is diagram case, while single WHEN-THEN pair would be a test case according to my terminology. Just to repeat: it is valid to have more than one diagram case for given N-tn coverage as the sequence of transitions which is generated is always different. The DSL which is used here (internal domain language implemented in Java) as well as framework (Sikuli) doesn’t really matter. They are used only as an example. Most often it is Selenium, or maybe some kind of strange things like Protractor which will be used in practice and Cucumber or other behaviour driven development library on top of this. The most important thing is that when using approach 2.0 the only important thing is to use any kind of domain language so that it can be used in HAS elements in model file in order to generate diagram cases automatically. State transition diagram test design technique starts to be useful finally – I have never seen anybody applying this in pratice which is weird as this is about all applications which have at least 2 transitions. Or maybe I didn’t see much? There are a few important points behind all this: it was very simple problem illustrated here where only few states and few transitions resulted in so many actions. It means the complexity hidden behind simple application is very large and so when modelling more complex applications we have to focus on small coverage or choose only part of application to be tested in this way. Also, I didn’t say anything about invalid paths through the diagram: we should also be checking if invalid paths are really invalid and how system behaves in such situation. Anyway, I am sure this is very useful technique to deal with problems which are modelled by state transition diagrams. This article is left here for historical reason. Please read newest version of the idea which is described HERE. 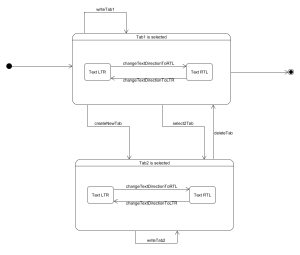 I was writing about 2 things in the past: state transition based testing and automatic testcase generation. This is actually about 2 complementary test design techniques: state transition diagrams and decision tables respectively (I do not want to write about details of these techniques now – this is a subject for separate post I hope to write in the future). In the latter post I showed how to automate test case generation for decision tables, the goal for today is to show how to start automation when diagram is the starting point. 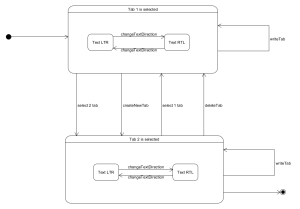 Combinatorial nature of a problem can be expressed as decision table and can be translated into xml for TCases application to process it and produce output which contains optimal set of test cases (automatic testcase generation). 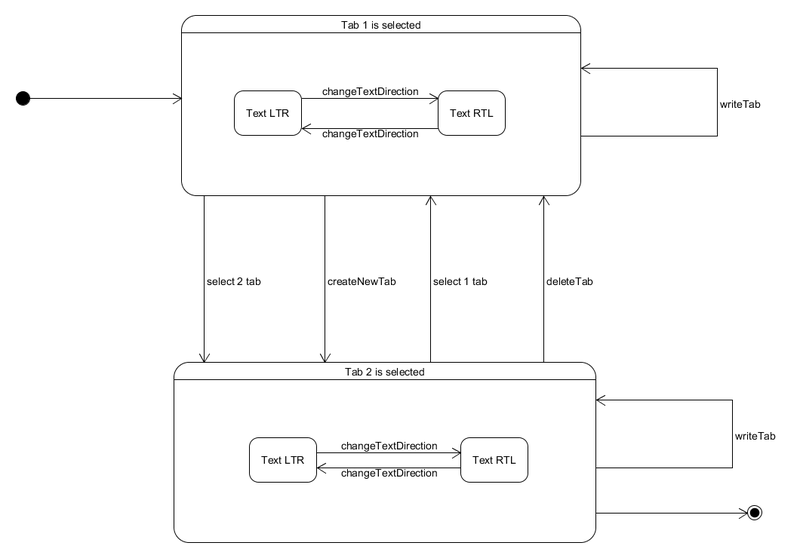 However, the most general way to analyze application under test is the state transition diagram. I already showed how to use this technique in order to achieve the coverage but I showed only the manual approach. Still, we need automatic test case generation! When diagram is in use, the trouble begins: how to process it automatically? How to generate set of test cases from a diagram? It was quite a while until I came up with some reasonable solution. I recently thought I could try TCases for this purpose. 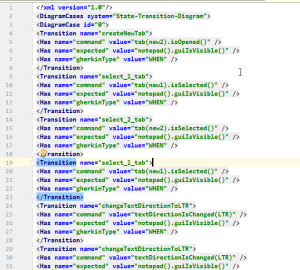 Although this is meant to identify variables and its values, if transitions of the diagrams could be considered as variables and their dependencies were described in TCases xml input file, I could get valid set of transitions and each transition would be used at least once in basic coverage setting. INPUT is the state name, VAR is the transaction. COMMAND in HAS elements contains domain language sentences which are executable after simple processing by domain language generator. WHEN elements describe needed dependencies to allow only valid combinations of transactions. 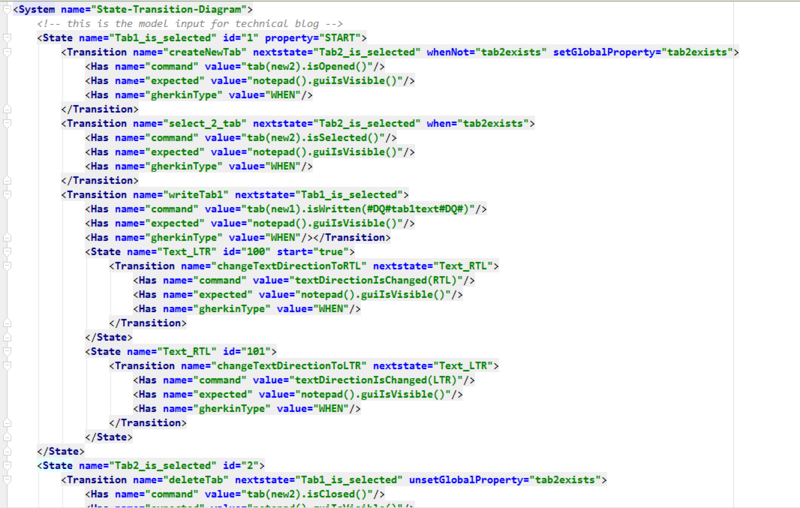 EXPECTED in HAS elements shows we just assert if Notepad GUI is visible after each set of transactions is run. 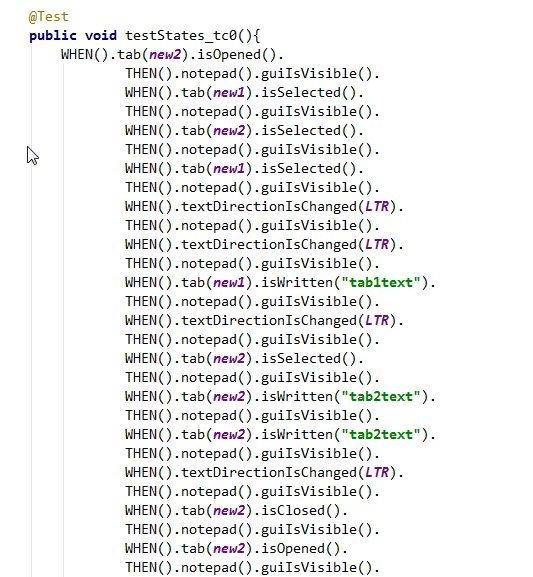 There is one problem with this file: in line 16 we need to give all the sequence of transactions needed to reach SELECT2TAB as TAB_1_IS_SELECTED state has 2 outgoing transactions. This shows there is a disadvantage of modeling the diagram in this way if there are states using very many transactions. The link to the source code is shown at the end of this post if you are interested. If curious, you can view all the code HERE under automatic-tc-generation-from-diagram branch. 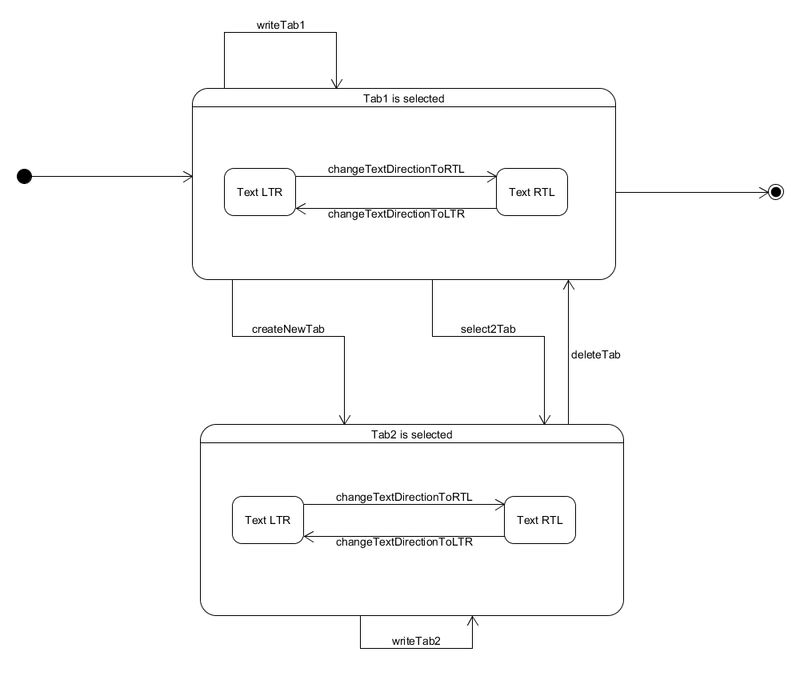 Even if not perfect this is a solution to automatically generate test cases from state transition diagram. Together with automatic test case generation for combinatorial problems described by decision tables it is very solid approach to quickly achieve optimal coverage and thus assure quality in the application under test. When dealing with a problem in QA practice it has often combinatorial nature. There are many possible combinations of either data, actions or other “inputs” which constitute the testing space. The testing space always tends to be infinite or at least extremely large as not only must one take into consideration the fact all the inputs have to be used in test runtime but also all the relations between them. Such a relations can only be tested when specific combinations of inputs will be used. Thus, the main problem to solve is how to choose those combinations. Well, this one is already solved here. When testing combinations are known next problem arises quickly. There are always many combinations to test. There is huge work to do to create automated tests out of generated combinations not to mention manual testing. And there is even more work to do when system under test changes as the tests have to be adjusted accordingly. Let’s solve this problem. Automation is the process which started quite long time ago. We are not testing manually, we have set of automated tests to run. We can use them on all the testing levels: small, medium and large tests are automated and used in development process continuously. 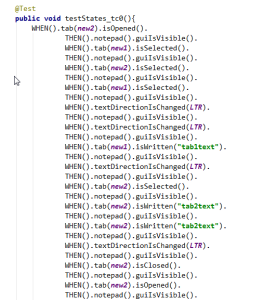 However before we can run the test we have to write it. It takes time as it is still manual process nowadays. It is now time to move on and start creating test cases automatically! There are domain specific languages in use at present. I wrote shortly about it here already. I am going to use internal domain language that is a language crafted from Java itself. Let’s assume, we want to test the behaviour of Notepad++ application in terms of new document settings with regards to format, encoding and default language. These settings are available at: Settings->Preferences->New Document. I am going to use all the available formats and 5 languages and encodings for the sake of simplicity (in reality, one needs to use all of them in the testing space of course). We have 3 variables: format, encoding and default language. Each variable contains information related to testing space that is which values are possible and at the same time it contains information related to domain language (Has attributes). Domain language contains two kinds of information: the one related to GIVEN and WHEN clauses (command) and the one related to THEN clause (expected). 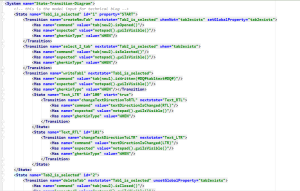 All the hashes and asterisks are used as placeholders only. It is much easier to write dsl related info when using external domain language like Cucumber. Dealing with internal one like in this example (Java) is more problematic because of braces and dots. Anyway, each variable value will be translated into GIVEN/WHEN and THEN sentences and each variable value which belong to the same testcase will be concatenated with each other to create a single dsl test case.